I celebrated my 32nd birthday with a quiet day at home and a leisurely review of the past year. It’s mind-boggling how each little step adds up to something more. 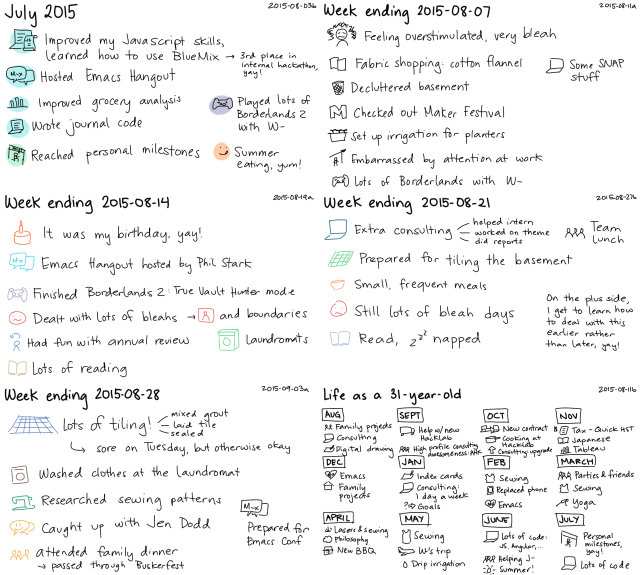 I’m glad to have built this habit of daily notes, weekly reviews, monthly summaries, and yearly recaps. It’s not always about small steps, of course. 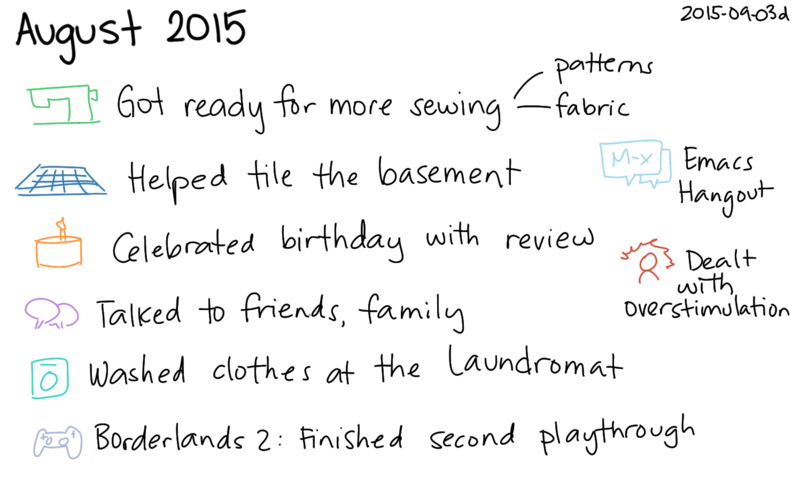 This month was a big one in terms of house projects. Tiling the laundry and bathroom in the basement took most of our time and energy. W- did all the heavy lifting and grinding, and I helped with whatever I could. It was fun getting the basement in order. While that was going on, we washed our clothes at the laundromat – my first time in at least eight years, I think! Borderlands 2 has become one of our favourite ways to relax. We finished the second playthrough (True Vault Hunter Mode) and we haven’t bought any of the downloadable content yet, so we’re mostly just practising skills and collecting loot. Borderlands 1 is also in our queue, thanks to J-‘s birthday gift for W-. The interface is a bit different, so it might take us a while to get around to it. Oh, and the Emacs Conference on August 29 was totally awesome! More about that later, once I sort out the videos. The scheduled talks and the impromptu talks were fantastic. I loved being able to watch and participate in it remotely. I’m looking forward to this becoming a yearly thing. I’ve been thinking about getting back into sewing. I’ve started researching patterns and picking up fabric so that I can ease my way in with simple projects. So far, so good. August was still pretty blah with the occasional low point, but now I know that I should carry around earplugs in case I get overstimulated by a noisy environment (if I can’t just simply leave it). The bleahs seem to be retreating, so maybe next month will be even better. Still, it was a good month. 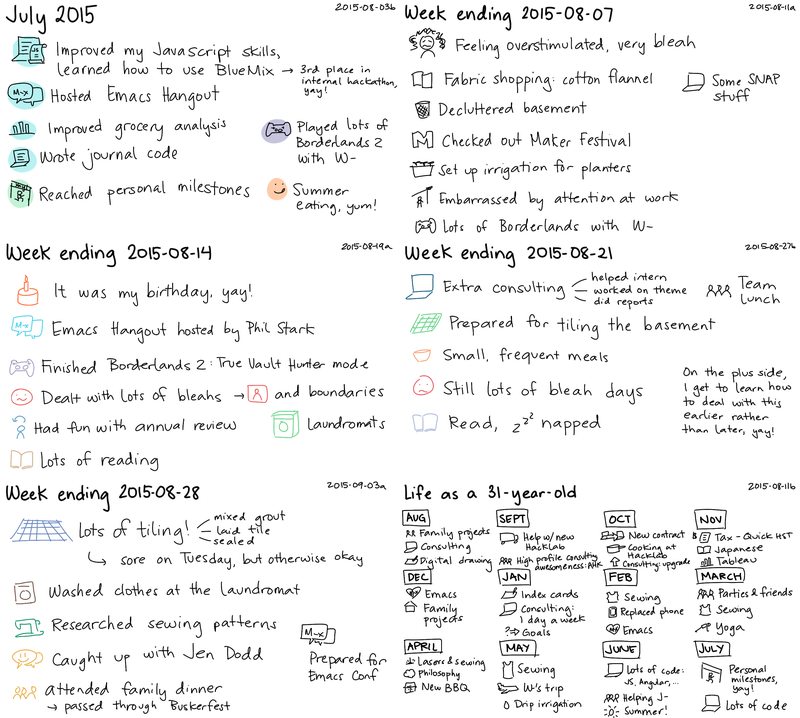 Lots of stuff done, lots of stuff prepared for even more doing, and lots of thoughts and little moments. Let’s see how September turns out!